Thomas Jayne, University Foundation Professor of Agricultural, Food, and Resource Economics at Michigan State University and co-leader of PIM’s research flagship Economywide Factors Affecting Agricultural Growth and Rural Transformation has been appointed a special advisor to the president of the African Development Bank (AfDB). In this part-time position Prof. Jayne will assist the Bank’s efforts to build the African Development Institute and to promote collaborative partnerships with African governments, national African research institutes, and international universities. 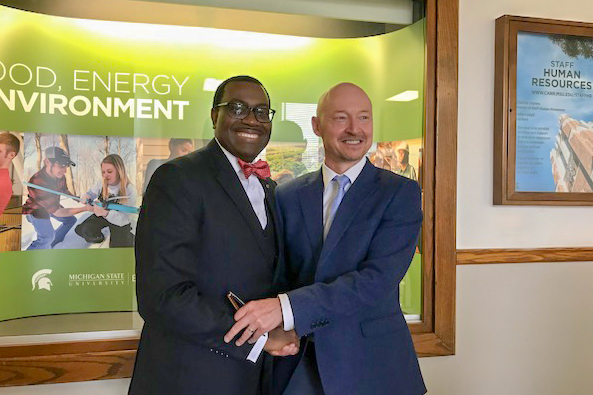 According to the MSU’s statement, Dr. Jayne has been working with Dr. Akinwumi Adesina and members of the Bank to build the capacities of the African Development Institute since November 2018. The Bank’s goal for the Institute is for it to become a world-class policy organization that provides thought leadership, knowledge management, and capacity development support to African governments, pan-African organizations, and non-state actors. From all of PIM, congratulations to Thom on this important role, and we are keen to develop future collaborations with the African Development Institute! Read the full statement about Dr. Jayne’s appointment on the MSU AFRE page.